Don’t miss the Great American Solar Eclipse, August 21, 2017! 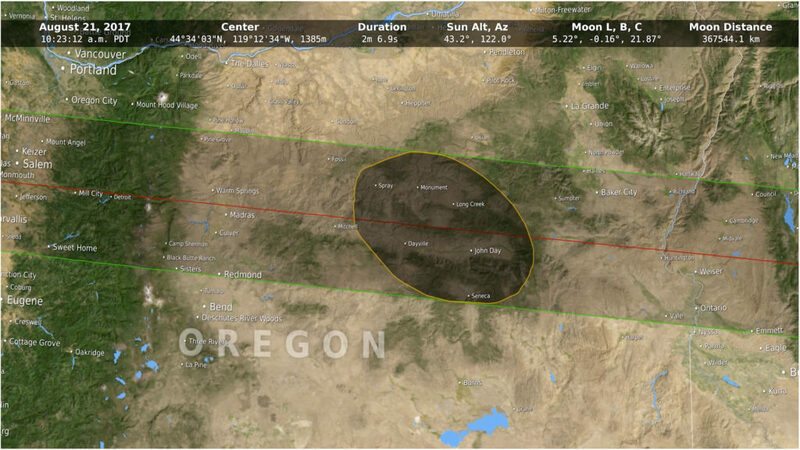 This is the first time in 40 years a total solar eclipse has been viewed in Oregon. The path of the umbra passes right over Central Oregon and the John Day Fossil Bed area. Want a perfect camp site right smack in the very center of the path of the eclipse totality? This one can’t be beat. We are located on private property just 5 miles north of the Blue Basin and Island in Time trails (John Day Fossil Beds – Sheep Rock Unit). 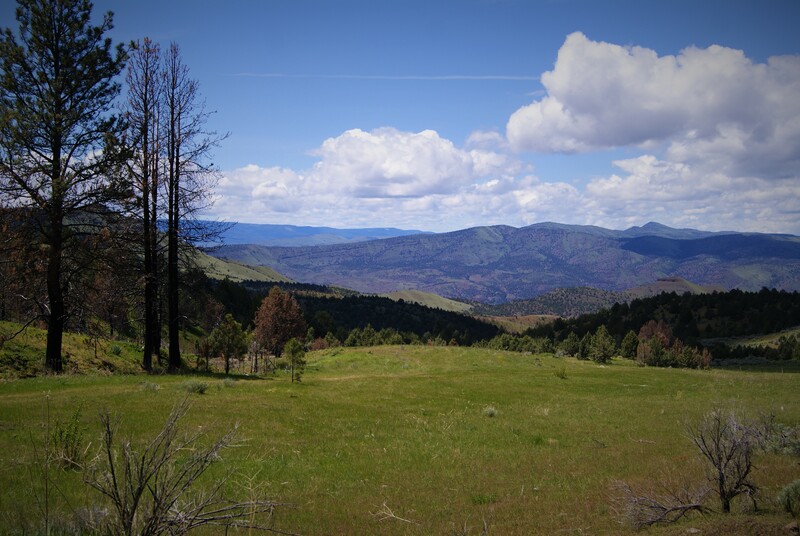 Our place is up a gravel county road 5 miles off Hwy 19 overlooking the John Day Valley. We’re just up the hill from Lands Inn Bed & Breakfast, at an elevation of over 4000 feet with a great viewing area free of tree cover. This is the dry side of Oregon, and while no one can predict the weather on August 21 until the week of the event, this area has far more sunny days than the areas west of the Cascade Mountains. 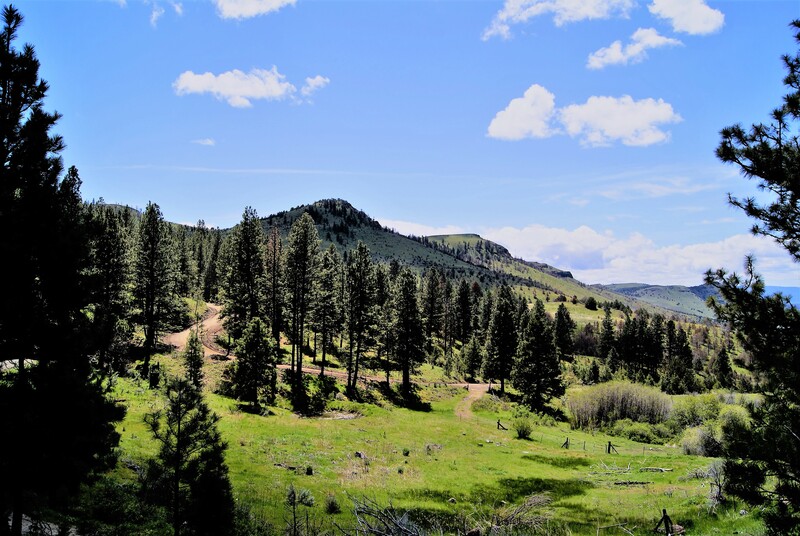 In addition to being a prime location to view the eclipse, it is a pleasant place to camp, relax, and enjoy the scenery with lots of available hiking and exploring in the John Day Fossil Bed area. The John Day River is close by and the Thomas Condon Paleontology Center, interpretive center for the John Day Fossil Beds, is just down the road. 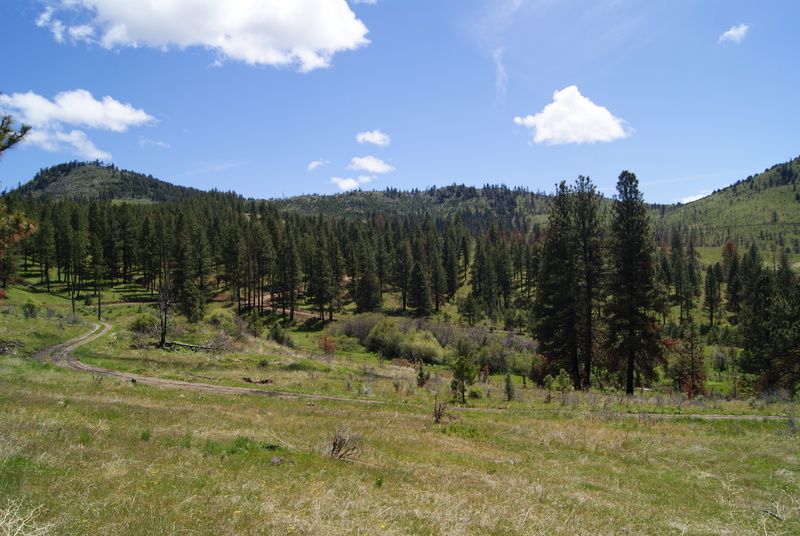 Lots of wide open terrain for self-contained camp sites. Looking east. Come enjoy a few days at our place and make the most of this once in a lifetime event. Few will experience this extraordinary event from a location like ours. Perfect camping site, looking to the east. • The rates are $35/night per person, with a three night minimum. We encourage you to plan a long, relaxing weekend and to arrive before the expected rush of traffic that will undoubtedly surge into the area at the last minute. • The day of Monday, August 21, 2017 counts as a full day regardless of your time of departure. • You are welcome to camp longer than the three-day minimum. • Because camping is on a first come, first serve basis, plan to come early, relax, and avoid the crazy traffic. • We have plenty of room for tents or RVs, so please pass the word and bring your friends and family. • Camping is self-contained, meaning you must bring your own water. Outhouses will be available. Pack it in, pack it out. Once your payment is received, your reservation is locked in. You will be sent a confirmation email for your camp site reservation as well as a detailed map and driving instructions. • Bring your own water. Please don’t forget to bring solar safety eye protection! Camp sites are on a first come, first serve basis. Rates are $35/night per person. Calculate the number of people in your party x 3 days (you are welcome to reserve more days beyond the minimum if you prefer). The date of Monday, August 21, 2017 counts as a full day regardless of the time you plan to leave. Reservations must be paid in full in advance and cannot be canceled or refunded for any reason from the date of this reservation agreement. Your signature is acknowledgement of acceptance of the terms of this agreement. This reservation agreement can and should be copied and signed for each camping group(s). Thank you for your reservation. We look forward to seeing you. Can’t read a PDF? Then right-click on the reservation form image and download the JPG. Print that and mail it with your payment to the address below. Once your Reservation Agreement Form and payment is received, it is locked in. We won’t change prices on you. 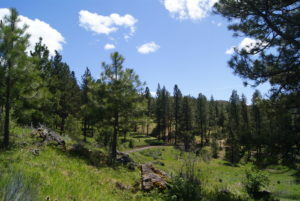 The area is along the John Day River “Journey Through Time” scenic byway. • This is a very rural area of Eastern Oregon with limited local resources. Keep your gas tank topped off, and bring extra food, water and personal medications. 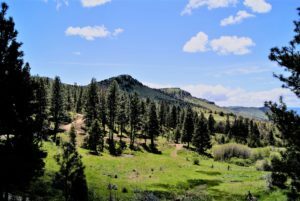 There are only a couple of one-store towns (Kimberly, Spray, Dayville) within 30 miles, and a couple of slightly larger towns within 50 miles (Fossil, John Day). • Keep it safe. Temperatures in August can reach over 100F and fire danger is high. The closest emergency room is 50 miles away in John Day. No open fires, firearms, fireworks, or ATVs off-road. • Make sure you have eye protection to view the eclipse. NASA states that only four manufacturers have certified that their eclipse glasses and hand- held solar viewers meet the ISO 12312-2 international safety standard for such products: Rainbow Symphony, American Paper Optics, Thousand Oaks Optical, and TSE 17.